Looking for a custom WordPress developer in Sydney? WordPress web design is a brilliant way to build a website that can grow with your business and you can manage the content cost effectively yourself if you want. We are WordPress web designers and developers based in Sydney, and we will always deliver a website that will help your business grow. Our very own websites all use WordPress, and it is our preference to the exclusion of all other content management systems. Our WordPress website designs are a blended with years of expertise and experience. We built WordPress websites using both our own theme framework and off-the-shelf themes. We can design custom theme to suit your business and promote your products and services. We ensure that the design of your website adheres to SEO principles to help drive traffic to your website. All our WordPress web design comes with comprehensive video tutorials so that you can be able to make changes to your website. If you require more assistance with updates and maintenance, we can provide ongoing support at reasonable price. Our website designers and developers will collaboratively work with you to create a complete WordPress web design for your business. We have a set of premium plugins which we use to enhance the search engine optimisation your site, and we will gladly connect you to Google Analytics for weekly web statistics reports. We have created a range of customised administration system options, page layouts, modules, widgets and post types for our hundreds of WordPress website clients. The experience our team has means that you get much more value than a typical WordPress site as a part of your website setup. It is ease of use. However, just like any other development platform, you need to have the expertise and experience to create a website that is well developed, optimized and functions the way it is envisioned to operate. How the plugins are used on site. How easy visitors can interact with your site. At Keen to Design, we ensure that the design codes are user-oriented and tailored to meet your organizational culture; thus, you gain a head start over others regarding Search Engine Optimization. While WordPress offers some themes for free use, many have downsides. Your website design should be unique and attractive to the users. If you choose to go with the publicly available themes keep in mind that tons of other sites are using the same design, hence you will not stand out from others. Besides, most of them are not fully optimized. Also, you are never sure if you will find incompatibility issues more especially with the plugins and add-ons. That said, we at Keen to Design custom design themes with our innovative coding ability, through responsive web design technologies and child themes. This is done in conformity to ensure longevity and robustness of your site. We at Keen to Design can help develop a unique online business presence through custom WP themes. There are some merits of getting a custom design work. It gives you the look and choice of your website. It indicates that you are about your image. It allows you work with the uncluttered code. As well, we also excel in developing custom plugins for your site. Public plugins are never ideal since some of them are buggy, they conflict with other plugins, and have limitations. Whether you are searching for a different or straightforward plugin for your organization, it is a good idea to get a custom developed plugin. Why we recommend WordPress for website development? It’s customizable. We can help you create a great-looking website that matches your brand and your vision. It’s easy to use. There’s a bit of a learning curve, as with most technologies, but all in all, it’s a fairly simple platform to use, especially when it comes to the basics, such as adding and editing content. It’s open source. That means it’s free, but it also means it’s extensible. You’re not locked into one narrowly defined template for your site. It’s well coded. WordPress helps keep your site fresh, current and search-engine friendly. It’s popular. In fact, it’s the most used CMS in the world. That means it comes with a ready-made community of users and developers for support and ideas. Keen to design is based on creative art that will excel your expectations. We will ensure your site is in perfect sync with your brand image, develop a design that engages your audience and provides your site functions with the way you expect it. Talk to us today! WordPress is a content management system (or CMS) that’s flexible enough to power the websites belonging to some of the biggest name brands in the world, including TechCrunch, Variety, The New Yorker and many more. Yet it’s user-friendly and straightforward enough to work for individuals and small businesses, too. WordPress provides a well-coded open-source platform on which you can build any number of types of websites, from personal blog to complex e-commerce sites. At the same time, it’s simple enough to understand that you don’t have to hire someone to keep your site updated with fresh content or to swap out an old logo for the new one. With a large, active community of users and developers, WordPress offers site owners a ready-made network of support. The core WordPress software is sufficient to create a basic website. However, most users prefer to customize their sites by adding specific functions and features. With WordPress, there’s no need to hire a developer to code these functions or features into the site’s core files. Rather, WordPress relies on little prepackaged files called plugins, which can greatly expand a site’s capabilities and performance. There are plugins that can add all sorts of new features, from contact pages to one-click backups and much, much more. There are two different “flavors” of WordPress, and it’s important to understand the differences between them to make the right choice for your needs. WordPress.org offers what is often called “self-hosted WordPress.” This is the individual package of core files that you can then upload to a hosting company’s server and build your own site, relatively from scratch. You’d have to purchase hosting space from the provider separately, but once you’re given the domain nameserver (DNS) information, you can then install WordPress on your server and then proceed to customize your site’s development (or have a WordPress developer take care of this for you). 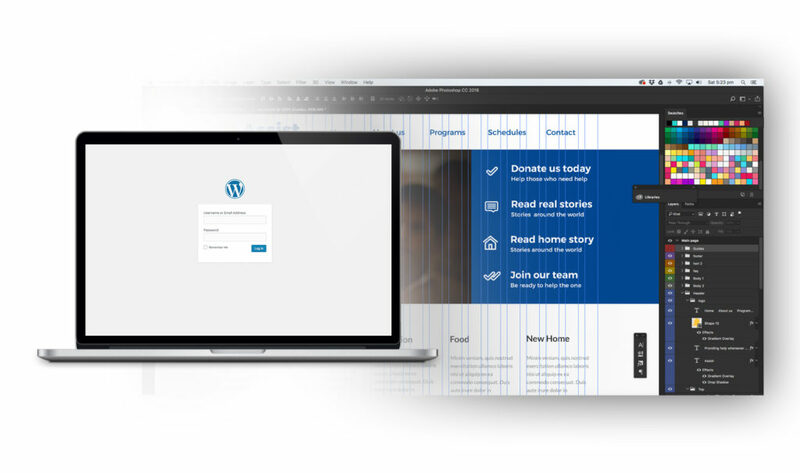 By contrast, WordPress.com offers a simpler solution that’s free, at least in its basic format, by including hosting with the stripped-down version of WordPress it offers. You can select one of a number of premade WordPress templates (called “themes”), and build your site’s content with little difficulty. However, this usually isn’t the right solution for business websites. The free account does not include your own top-level domain, and because the servers are controlled by someone else, you may face heightened restrictions about the type of content you can publish on your site. We recommend self-hosted WordPress, using WordPress.org. Is WordPress good for business websites? Absolutely! While WordPress was originally conceived as a personal blogging platform, in the years since it’s evolved tremendously from that first iteration. Now it’s ready for businesses of all sizes and types, even banking institutions. In fact, some of the biggest business names in the world use WordPress. It’s customizable enough for any brand, and it’s sturdy enough even for large eCommerce sites. What is the cost to build a good WordPress website? Our WordPress site development fees will vary depending on the scope of each specific project. We work with each client to set a project description and detailed scope that fits within that client’s budget, so that no one feels pressured into buying more site than they really need. Depending on the project, you might encounter other fees such as hosting, customized design, icon design, logo design, SEO services, and extras that can add to the total cost. How long does it take to build a custom WordPress website? Again, that will vary from project to project. However, on average, it takes our design and development team 4-6 weeks to carry a site from client intake to public launch. If your site requires additional services such as SEO or graphic design, that might add to the timeframe, of course. How can I build a WordPress website for free? If you’re just looking for a simple site for your own personal use, WordPress.com is probably your simplest, fastest bet. The site will walk you through the process of creating and designing your site using its prefabricated themes, and you can theoretically have a site up and running in a few minutes. However, WordPress.com doesn’t allow for the same level of customization and functionality as self-hosted WordPress does, so be aware of its limitations before you commit to using it for a business site solution. Can I make a one-page website in WordPress? You sure can! The WordPress development community has created thousands upon thousands of vibrant, well-coded themes that can alter the look and feel of your site, many of which are designed specifically for one-page sites. These sites typically use a longer scroll, to allow more content to display on a single page, and are quite popular for businesses that haven’t launched yet, organizers of events, and other limited-use purposes. How can I find the best WordPress website designer? That’s a great question, and it’s one we get a lot. With so many developers and designers available, it’s easy to start to feel overwhelmed by all the choices. We recommend starting with design firms with published portfolios so you can visually identify the styles and aesthetics you most resonate with. Look for companies that are willing to speak with you, either in email or on the telephone, to discuss your project with you, and firms that don’t try to sell you on some kind of prefab package deal that doesn’t feel like a good fit with your business or your goals. Finally, ask for full disclosure on fees and costs. If a design company can’t tell you exactly what it’s going to cost you up front, it may be difficult to know whether the final invoice is reasonable. How to check if a website is WordPress? There are more than one ways to tell if the website is built using WordPress or not. There are few common ways that we will share with you to check if the website is built on WordPress or not. 1. First, you can check the source code of the website to get to know if the website is built on WordPress. When you have opened a site, you can right click on any section of the website and click the option named, ‘View Page Source’. In the source code, you will be able to see if the important files are being loaded from the wp-content folder. You can also search the source code with the word, ‘WordPress’ to get complete information. 2. Another way is to check the license file. All you need to do is to add license.txt to a site’s URL and you will be able to get the WordPress license file. 3. The next way is to check the WordPress login pages. Most common WordPress login page looks like www.yoursite.com/wp-admin. You can add wp-admin at the end of the URL to check if the site is built on WordPress or not. However, the sites with more security usually change their default login pages. There are few common pages that you can try including wp-login.php and wp-trackback.php. How to find the theme name of a WordPress website? There are more than one methods to check the name of a WordPress theme that a specific website is using. 1. The first method is to check the name of the theme using IsItWP. This tool will allow you to check the plugins and themes that a specific WordPress website is using. After visiting this website, you will have to enter the URL of the website that you want to check. If the website is built on WordPress, then it will check which WordPress theme is being used by the website. After that, it will display the results and you will be able to know the name of the theme. However, you may not be able to know the details about the custom WordPress theme. 2. The second method that you can use is to check manually which theme is used by a WordPress powered website. WordPress owners usually change the WordPress theme name. However, every WordPress theme has a style.css file. This file has the details including the name of the theme, theme author and much more. How to find plugins used in a WordPress website? There are multiple ways to find the plugins used in a specific WordPress website. Let’s have a look at how you can find the plugins used by a specific website. After this, you will be able to find a list of URLs for each plugin used by that website. If this does not work for you, you can move to the next method. 2. The next method that you can use for finding the plugins used by a specific website is by checking the source code of the website. You can right-click anywhere on the website and click the button named, ‘View Page Source’. You will be able to get all the source code of the website and there you can search for ‘wp-content/plugins’. This way, you will be able to find the name of many plugins used by that specific website. 3. Another way to find the plugins used by a specific website is to use WPThemeDetector. You can visit this specific tool and find the plugins and theme used by a specific website. How to clean malware from WordPress Website? If you are facing multiple problems with your website and you are trying to clean malware from WordPress website, then you should know that there are various ways to do so. Here are a few steps that you will have to work on when trying to remove the malware from your WordPress website. – Make sure to back up the files of your website and database. – Download the backup files and examine them. – Delete the files in public_html folder. – Don’t forget to reset passwords. – Reinstall plugins and theme that you wish to use. – Upload the files from your backup. – Install security plugins and run scans. – Scan your computer as well. What percentage of websites use WordPress? You will find different values when you search for the percentage of websites that uses WordPress as CMS. We all know that WordPress hits the 25% mark back in November 2015. This data is taken from the web technology survey firm W3Techs. According to them, WordPress has 30% of the web now and it will keep increasing regardless of the new content management systems on the internet. This figure is related to the entire web that also includes websites that don’t use CMS. How to backup WordPress website manually? The best way to take backup your WordPress website manually is through cPanel. You will have to follow the steps below to easily take backup of your WordPress website. First of all, you need to login to your cPanel hosting account. Once you are logged in, you will have to navigate to the File Manager option that will lead you to the public_html directory which is your home directory. Here, you can locate your WordPress directory where you have installed WordPress. You need to click on your WordPress directory and then you will have to select the option to compress the directory. Here you can select the compression type. It’s better for you to compress in a ZIP archive. After hitting the compress button, it will start compressing your WordPress directory and will create a folder. Now you need to click on the ZIP archive which is just created on your server and then hit download button that appears on the top menu. You can choose the location on your local drive and download the complete archive to your hard drive. Congratulations, you have successfully taken the backup of your website. How to do SEO on WordPress website? With WordPress, on-site SEO is extremely easy. There are various ways to improve the SEO of your website and you will have to follow good SEO practices to improve the SEO of your website. Here is what you can do to improve things for yourself. You should consider altering the default permalink structure. Make sure that you are switching to text-based permalink structure so you can improve the SEO of your website. Consider installing an XML sitemap plugin. It will allow Search Engines links to all the pages on your website in a sitemap. You should install an SEO plugin to boost the SEO of your WordPress website. There are tons of things that you can forget when improving the SEO of your website. A good SEO plugin will allow you to create a checklist. Use a caching plugin to speed up your WordPress blog. Consider using CDN services to improve the overall performance of your WordPress site. Consider linking to your old posts when creating new content. Consider creating landing pages to improve search engine visibility. Keep images optimized on your WordPress blog. Always focus on the responsiveness of your WordPress blog. How to edit WordPress website content? If you are editing existing WordPress website content, then there is a simple way to do so. You will have to follow small steps to edit the current content on your website. First of all, you will have to log into your WordPress website. You can now start editing your content by visiting Post tab on your WordPress dashboard. You can then select an existing post if you want to edit that post. If you are looking to create a new post, then you will have to click the button ‘Add New’ where you will be able to create a new post. Once you have finished editing a post, you can either save draft or publish the post. If you would like to finish the post later, then you should click on save draft. If you are adding content through pages, then you will have to click on the tab Pages in your WordPress dashboard and then select a page that you wish to edit. Same guidelines are to edit the page’s content and then you can publish or save draft. To keep your website secure from hackers and potential hacking attempts, you will have to focus on few basic things that will help you in the long run. Make sure that you are developing few important security practices that will help you later on. Let’s have a look at how you can secure your WordPress website from hackers. 1. You must start updating WordPress as soon as there is an update. WordPress releases updates frequently and you will have to keep updating your website on a regular basis so you can avoid all the problems later on. In the updates, there are multiple important things that cover the potential security risks. If you are not updating your WordPress core, then it can be vulnerable to the potential hackers. 2. You must understand the importance of WordPress security. WordPress is an open source platform and there are lots of risks involved when you are creating a website. Make sure that you are keeping the focus on the security of your website to avoid problems later on. 3. Always focus on creating strong WordPress admin password. 4. You must always have a backup solution to avoid problems later on. Can I create a WordPress website offline? If you want to create a WordPress website offline and then put it online, then there are ways to do so. You can surely create a WordPress website offline using tools like XAMP or WAMP. These tools work as localhost that will allow you to run your website offline. You can easily use these tools like an online hosting panel and complete your website before putting it online on a live server. How to build an affiliate website using WordPress? You can create an affiliate WordPress website similar to a normal WordPress site. However, you will have to select the right niche for the affiliate program. There are multiple programs that you can start including Amazon Affiliates, ShareAsale and much more. Here is what you need to do when creating an affiliate website using WordPress. Setting up a WordPress website just like any other normal WordPress site. Make sure that you are selecting the right domain name and web hosting plan. Selection of the products and affiliate partners is a tricky part. Make sure that you are selecting your affiliate partners and products wisely. Focus on adding high quality content when you are creating an affiliate WordPress website. When you are posting reviews, you should have authentic information to improve chances of making sales. Focus on promoting your affiliate WordPress website by publishing high quality reviews. By attracting more visitors, you will be able to improve the affiliate program. Keep monitoring your performance properly and focus on the overall analytics. Another thing that you will have to do is to choose right tools and use right resources for your WordPress review site. How to host WordPress website for Free? How to maintain WordPress website? If you are running a WordPress website, then you must focus on few maintenance tips to make things better for yourself. It is always necessary for you to maintain your WordPress website properly so you can avoid all the problems later on. Whether you have an online store or a business website on WordPress, you must always pay close attention to few maintenance tips that will help you in the long run. Here are few important tips to maintain your WordPress website so you can avoid security threats and regular problems. Always backup your WordPress site on a regular basis. Installing a good backup plugin can resolve this problem for you. You should delete all unused plugins as well. Always focus on the security of your WordPress site. Installing a good WordPress security plugin can help you. You should optimize your database to avoid slow loading issues. Keep all the software versions up to date including your WordPress. Learn to improve website’s speed. How to restore WordPress website from backup? When you are trying to restore your WordPress site from the backup, you will have multiple options to do it. You can either take backups manually or you can have a good WordPress backup plugin that will help you restore your WordPress site from backup. We will be sharing guidelines that will help you restore your WordPress website using BackupBuddy WordPress plugin. First of all, you will have to visit your WordPress dashboard and then go to the BackupBuddy tab. Here, you will be able to see the option of Restore/Migrate. After clicking that page, you will have to download a file named, importbuddy.php. Here, you will be able to provide password for this file and you will also require this password while restoring your website. If you have a copy of your WordPress site’s backup, then you will have to place backup zip file and importbuddy.php file on your computer. Now you will have to connect to your computer using an FTP. If you have a complete backup of your website, you can delete all the files and folders from your server. Once you have deleted everything from the site’s server, you will have to upload the backup zip file and importbuddy.php file to website’s root directory. Here, you will have to provide that password that you previously created while downloading importbuddy.php file. Once you are in, you will be able to see the backup file that you uploaded along with the importbuddy.php file. Importbuddy will then start unzipping the backup file and you will be able to see a success message once it is extracted. On the next page, importbuddy will ask you for the information including site URL, and the database details. Here, you will have to enter the database information of your website. After that, importbuddy will start importing your data. In the next step, importbuddy will update all the site URLs and other information. Once, the process is completed, you will be asked to test the website and if everything is working fine, then it means you have successfully restored your WordPress website from a backup. How to build a comparison website using WordPress? Creating a comparison website with WordPress is similar to creating any other website using WordPress. All you have to do is to choose the right domain name and install the WordPress. Once you have installed the WordPress, you will have to look for the perfect WordPress theme that will provide you all the features for creating a comparison website. There are multiple premium WordPress themes that can be a perfect option for you when creating a comparison website using WordPress. First, you will have to choose the right price comparison WordPress theme that suits your requirements. Secondly, you will have to choose the best WordPress plugin that will provide you complete features for creating a comparison website. You can choose plugins like WooCommerce Price Comparison, Go Pricing, and Content Egg. How to transfer WordPress website? There are multiple ways to transfer a WordPress website to a new host. We are going to share a step by step guide that you can follow to make the transfer. Make sure that you have selected a new host and you are ready to make the transfer. We are going to use a plugin named Duplicator that will help you transfer a WordPress website easily. First of all, you will have to setup Duplicator so you don’t have to face any hassle while transferring your website to a new host. First of all, you will have to install the plugin and then you will have to create a new package by visiting the Duplicator tab on your WordPress admin dashboard. This complete process may take few minutes and you will be able to get 2 different packages. One is the archive folder, and the second is the installer package. After the completion of the process, make sure to click, ‘One-Click Download’ button so you can save files to your computer. In the next step, you will have to import files to a new host. Make sure that you are connecting to a new host using FTP. Here, you will have to enter the server’s IP instead of the website URL when connecting to the new host. After entering the details, you will have to upload both files including installer.php file and the archive zip file to the root directory of your website. To run the installer, you will have to change the hosts file and then move to the next step. In step 3, you will have to create MySQL Database on your new host. Creating database is similar to the one that you have been doing previously. You can create new database and then add all the information required. Make sure to save all the information you receive while creating new database on the new host. After running few basic tests, installer will take you to the next step where you will be asked to provide MySQL host, database name, username and password. If the information you entered is correct, it will proceed to the next step and import the WordPress database from the archive zip file into the new database. Once it is done, you will be able to login to your new site. You have successfully transferred your website to the new host but, your domain still points to your old hosting account. You will have to change the DNS nameservers as you did when you first created a website. Once you have changed the DNS nameservers, you will be able to completely transfer your website to the new host. How to redirect a WordPress page to another website? Redirecting a specific WordPress page to another website is not at all difficult. All you have to do is to search for a specific Plugin named, “Page Links To” and it will do the job for you. Here are the steps that you need to follow when redirecting a specific page to the URL. Go to the plugins page in your WordPress admin dashboard. Click ‘Add new’ and search for the plugin named, “Page Links To”. After installing and activating the plugin, you can move on to create a page that you want to redirect. After creating a page, scroll down to see the options from ‘Link Pages To’ plugin. Enter the URL you want this page to be redirected to. Choose the option if you want to open link into a new tab. Publish the page and you are good to go. How to check views on WordPress website? When you are trying to view complete stats of your WordPress website, you should look for the right plugin that will provide you such information. You can get all the stats using JetPack WordPress plugin. You can view your WordPress stats in different ways. First of all, you will have to install the JetPack plugin by visiting the plugins tab in your WordPress dashboard and then install and activate the plugin. Once you have installed the plugin, you can then move on to the WordPress dashboard and click ‘Screen Options’ tab on the top bar of your WordPress dashboard. Here, you will be able to see multiple checkboxes and you will have to check the box named, ‘Site Stats’. After checking this box, you will be able to view the site stats including number of views you are getting. Site Stats will allow you to check the site visits, most viewed pages, and the search terms that people are using to find your website. How to make your WordPress website private? When you are trying to make your complete WordPress website private, you will have to understand the limitations you will face later. First of all, you need to understand that if you have made your WordPress website private, the site won’t appear in the search engines. Moreover, it will only be visible to the administrator or other users if applicable. To make your entire WordPress website private, you will have to follow few basic steps. Let’s have a look at how you can make your WordPress website private. – Visit your WordPress dashboard. – In settings tab, you will be able to see an option named, ‘Privacy’. – Select that option. -Here, you will be able to see three different options including Public, Hidden, and Private. Here, you can select Private to make your WordPress website private. -Save changes and your WordPress website will become private. – Navigate from Dashboard > Posts > All Posts. – Bring cursor to a post that you want to make private. – Click the button ‘Quick Edit’. – You will be able to see a checkbox for making it Private. – Click that option, and then update the post. Your page/post will become private. How do I Install Google Analytics on my WordPress website? When you are trying to add Google Analytics to your WordPress website, you will have to follow few basic steps. If you are not using any plugin, then the process will be slightly complicated. Here is what you need to do when adding Google Analytics to your WordPress website. – First of all, you need to get your Google Analytics Tracking Code. You will have to login to your Google Analytics account and then select the website for which you require a code. – After selecting the website, you will have to visit the tab named, ‘Admin’. Go to the Property Column and then select the Tracking Info. Here, you will be able to get tracking code. – After copying the tracking code, you will have to add this code to the header.php file in your WordPress. You will have to enter your WordPress dashboard > Appearance > Editor. Here, you will be able to see a file named, ‘header.php’. Click that file and it will open in the editor. Here, you will have to place that code you copied right before the closing </head> tag. Update and save the file. Now, you have successfully added Google Analytics to your WordPress website. How to add a favicon in WordPress? Most of the WordPress themes have the option of adding a favicon for your website. However, if your theme does not provide this option, you can easily add favicon image to your WordPress website. Here are few steps that you will have to follow to add favicon to your WordPress website. – Go to your WordPress admin dashboard. – Click on the tab named, ‘Appearance’. – Click on the theme editor. -Once you are there, you will have to open the file named, ‘header.php’ and edit it. Now you can save the changes and you will be able to add the favicon. How to add Google reviews to WordPress Website? – Install Google Places Reviews plugin to your WordPress website from the WordPress plugin directory. – After installing and activating the plugin, you can access the settings of the plugin. -Here, you will have to enter Google Places API Key. – After setting up the Google Places API key, you will be able to connect to Google and you will be able to get a shortcode that you can insert anywhere on your website to display Google reviews. What is WordPress website builder? WordPress website builder is a content builder that will help you create pages in an excellent way. If you are trying to create a page with lots of elements, then you can use a WordPress website builder that will help you in the right way. These are drag and drop page builders that will allow you to add multiple content elements on a single page. It will allow you to create different sections in a single page where you can add different information. If you are creating a business website, then using a WordPress website builder is the best way to do so. How to install visual composer page builder for WordPress? If you wish to install Visual Composer page builder plugin for WordPress, then you will have to follow few basic steps. Here is how you can install Visual Composer page builder on your WordPress website. – Open your WordPress admin dashboard and navigate to the plugins tab. – Select ‘Add New’ option on the top. – Select ‘upload plugin’ option on the upper left corner. – Select the file visualcomposer.zip that you have purchased or downloaded on your computer and click install now. – WordPress will install the plugin automatically. – Activate the plugin and start using it on your website. Installing WordPress theme is very easy. You don’t have to go through any hassle while installing a theme on your WordPress website. However, if you are using a theme from the WordPress themes repository, then you can do so by searching for a specific theme. If you have already downloaded a WordPress theme on your computer, then you will have to upload the theme using ‘Upload Theme’ option while installing a new theme. Here are the steps that you must follow when installing a WordPress theme. – Open WordPress admin dashboard and go to Appearance > Themes. – Search for the theme you want to install. If the theme is available in the directory, then click install and activate the theme. – If you have downloaded the theme on your computer, then click Upload theme button and upload the zip file you have. -WordPress will automatically upload the theme and install it for you. -Activate the theme and start using it on your WordPress website. How to add slider in WordPress theme? If you are using a premium WordPress theme, then you will be able to get an option of adding slider to your pages. However, if there is no such option, then you can easily install a good WordPress slider plugin that will provide you complete features. Here is what you need to do when adding slider in WordPress theme. – First of all, you will have to install and activate a WordPress slider plugin. You can pick any slider plugin out there that has excellent reviews and that has been updated on a regular basis. – At step 2, you will have to create an image slider with the help of that plugin. – Once you have created a complete slider with the help of a slider plugin, you can copy the shortcode and then paste it on the page where you want a slider to be displayed. How to delete WordPress account? If you are not sure how you can delete your WordPress account, then you should know that it is a simple process and you can do it within minutes. Here are few steps that you will have to follow when you are thinking of deleting WordPress account. – First of all, you will have to visit your WordPress dashboard page. – Once you are logged into your website, you will have to click ‘My Blogs’ on the left menu. – After that, you will have to click on the name of the blog that you wish to delete. – After selecting the blog, you will have to click on Tools on the left menu. – Here, you will be able to choose Delete Site on the left menu under Tools. – If you want to delete your blog permanently, then on the next dropdown, you can select permanently delete the blog and all content. – Your WordPress blog will be deleted. How to increase my WordPress website speed? If you wish to increase WordPress website speed, then you should know that there are plenty of important things that you will have to do. Your WordPress website’s speed does not depend on a single factor. You will have to check multiple things in order to speed up your WordPress website. Here are few basic steps that you will have to follow so you can come up with a great solution. First of all, you should always select an excellent and reliable web hosting service. After that, you will have to choose a fast and highly responsive WordPress theme. The next thing that you will have to do is to install a caching plugin to your WordPress website. Make sure that you are also using Content Delivery Network (CDN) services. Make sure to optimize all images on your WordPress website. Optimize the database as well. Don’t forget to optimize your homepage so it can load quickly. Don’t use a lot of plugins and delete plugins that are unused. How to fix the 403 forbidden error in WordPress? If you are facing a 403 forbidden error in WordPress, then you should know that there can be a number of things going wrong. There are various ways to fix the error. However, it is necessary for you to understand why this error is displayed on your website. Here is how you can fix 403 forbidden error in WordPress. First of all, if the error is triggered by a WordPress plugin, then you should consider temporarily deactivating all the WordPress plugins. If the problem is resolved, then it means one of the plugins is causing this issue. You can figure out which plugin is causing a problem by activating plugins one by one. If there is a corrupt .htaccess file, then you will also face 403 forbidden error. To fix this, you will have to connect to your WordPress site using FTP. The next thing that you will have to do is to locate the .htaccess file and take backup of the file. After taking backup of the file, you can delete the file from the root directory. If it resolves the problem, then the file was corrupt. To create a fresh file, you can login to your WordPress website and visit Settings > Permalinks. You can simply click save changes and WordPress will create fresh .htaccess file. How to fix crawl errors in WordPress? If you are facing crawl errors in WordPress site, then you should know that there is a simple way to fix it. However, you must understand the problem first. You will face Access Denied error which means Googlebot can’t crawl the page. Here is what you need to do when fixing crawl errors in WordPress. First of all, you should remove the login from pages that you wish Google to crawl. Make sure to check your robots.txt file to ensure that the pages listed there are meant to be blocked from indexing. You need to use robots.txt tester so you can see warnings on your robots.txt file. You will have to use a user-agent switcher plugin for the browser to see how the site is appearing to Googlebot. Make sure to scan your website that will allow you to log into the pages. Fatal errors in WordPress could be because of many reasons. However, most of the time, people face this error because of a specific plugin. If you are also facing this error because of a plugin, then you will have to identify which plugin is creating a problem. Here is what you need to do so you can get rid of this specific error. Check the error message and identify the root cause of an error. Connect to your website using FTP or cPanel. Locate the plugin which is causing the problem. Delete the plugin and you will be able to get rid of the error. How to fix WordPress error establishing a database connection? If you are facing error establishing a database connection while visiting your WordPress site, then there can be multiple reasons for this. This error can be generated due to multiple reasons including corrupted WordPress files, corrupted database, server down, and too much traffic. Here is what you can do to fix this error. Make sure to get in touch with your hosting service provider and explain the problem you are facing. If there is some problem at their end, then you will be able to get a response and your website will be fixed. If contacting hosting service provider does not resolve the issue, then you will have to check the plugins and themes to make sure that none of the files are corrupted. You can check them one by one and if it does not resolve the problem, then you can move to the next step. At this step, you will have to check if your WordPress database is not corrupted. To see this, you will have to visit the login URL of your website. If you are seeing a default message of repairing your database, then you can click Repair Database so WordPress can start repairing it. If the problem is still there, then you will have to check the Database connection credentials. Make sure that all the credentials are correct. If there is something wrong, then you will have to provide correct Database Connection Credentials to resolve the error. Here, you will have to restore the default WordPress files. Make sure to connect to your WordPress website using FTP. You will have to replace all the WordPress files with the latest WordPress that you have downloaded and then replace all the files. How to fix structured data errors in WordPress? Before you go on to fix the errors, you need to understand what structured data errors are. Structured data is basically information about your website’s post or article. If you are facing this error, then there could be multiple reasons for this error. Here is what you need to do to fix these errors. First of all, you will have to check the errors using Google’s Structured Data Testing tool. You can go to the Webmaster Tools and then Appearance > Structured Data. Here, you will be able to see the list of the errors. To fix these errors, you need to check theme settings to see if there is any option to activate. If you don’t see any option, then you will have to get the code so you can get the missing tags in the HTML. Make sure to use a well-structured data friendly theme. How to fix W3c errors in WordPress? If your CSS is not loading properly, then there can be multiple problems. It usually happens when you are using plugins that works by inserting shortcodes. Here is what you can do to rectify this specific error. You will have to install a minification plugin. Such a plugin will bundle all the CSS on your page into a single file and include it in the <head> section. You can use W3 Total Cache plugin to make things easier for yourself. After installing the plugin, you will have to enable minification. You will have to visit plugin’s settings and go to Performance > General Settings and then enable Minify. This will only include CSS on pages where needed. How to build an online store with WordPress? Building an online store using WordPress is very easy. All you have to do is to set up a regular WordPress website and then use few plugins that will help you manage your online store. Here are few important steps that you need to follow to create an online store using WordPress. Select the right niche for your online store and register a catchy domain name for your store. Once you have done that, you can move on to select the best hosting service for your WordPress online store and set up WordPress on your hosting account. Select the perfect WordPress theme for your online store. Make sure that the theme provides you all the great features for your online store. After setting up WordPress, you will have to download WooCommerce plugin from WordPress plugin repository that will help you set up your online store. After installing WooCommerce, you can then check all the settings of the plugin and set it up according to your requirements. The next thing that you will have to do is to start uploading products in your WooCommerce. You can add images and product type according to the requirements. Once you have added all the products in WooCommerce, you can then launch your online store without any delays. How to change Wp Admin URL in WordPress without plugin? If you want to create a WP admin login URL of your website without using a plugin, then you will have to follow a simple procedure to do so. Here is what you need to do to change the default login URL of your WordPress website. First of all, create a new file New-login-url.php (you could name anything you want). Then, open wp-login.php file and copy all the code in this file to the file you just created and save it. Now, you need to find and replace all the instances of wp-login.php to your new login file name and save it. After that, you can delete wp-login.php. Now you can login through new login URL. I can’t access Wp admin after changing URL, what should I do? If you have changed the default login URL of your WordPress website, and now you are unable to log into your website using new URL, then you will have to make few changes. Make sure that you are logging into your cPanel account and then accessing phpMyAdmin. Here, you need to find database and then you will have to check wp_options Table. Make sure that site URL field and home field are correct. If they are not correct, then enter the correct values and then save it. You will be able to login after making these changes. What is WordPress API and how to use it? If your WordPress is asking you about APIs at multiple points and you have no idea what they are, then you are in good hands. You need to understand What WordPress API is and how you can use it. The WP REST API allows you to access your WordPress site’s data through an HTTP REST API. Moreover, the most recent version of WP API, the resources include Posts, Pages, Media, Post Meta, Comments, Terms, Taxonomies, and Users. You can use WP API to create Post, retrieve post, update a post and delete a specific post. WordPress allows you to run multiple sites from one WordPress installation. If you want to create multisite using WordPress, then you will have to follow a simple procedure to do so. WordPress Multisite is a WordPress feature that will allow you to run different sites. All of these installations will create a network and all these sites in a network shares one database. They will have separate tables within a specific database and different directories as well. The admin of the network is the only one who can manage all the plugins and themes for all the sites. If you don’t know what a WordPress child theme is, then a child theme in WordPress is a sub theme that will inherit all the functionality and features from its parent theme. It will also inherit complete CSS from its parent theme. Child themes in WordPress is a safe way to customize a WordPress theme as the changes you make in a child theme won’t affect the parent theme. The latest WordPress version known as Gutenberg is a new editor for WordPress which is named after Johannes Gutenberg who invented a printing press with moveable type more than 500 years ago. This new WordPress editor is different from all the previous WordPress versions and it allows users to create blocks on a specific page or post. The basic goal behind this change is to make things easier for the users to create pages and posts. What is http error 500 WordPress? If you are facing Http error 500 in WordPress, then it means you have a corrupted .htaccess file. It is known as WordPress 500 internal server error. It also appears if your PHP memory limit is exhausted. You can check the memory limit and increase it or repair the .htaccess file to get rid of the problem.